Dangers of using copper sulfate. 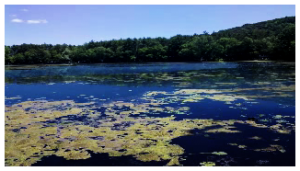 Excessive algae may accumulate in ponds. It may float on the surface and form a scum. Excessive algae can reduce the amount of oxygen in a pond to such an extent that fish die. Parasites such as ich may also harm pond fish. Copper sulfate kills algae and many fish parasites on contact. It also will kill many weeds that infest a pond. Uniform spraying of a water solution of copper sulfate will guarantee that the copper sulfate spreads evenly across the pond. It is an inexpensive treatment and easy to apply. Excessive application of copper sulfate will kill fish, especially if water is low in alkalinity. If a pond contains less that 50 milligrams of alkaline material per liter, a pond should not be treated with copper sulfate, according to the University of Kentucky College of Agriculture. The use of copper in indoor tanks, where algae and zooplankton are absent, does not present the same problems. However, you still need an accurate measure of the total alkalinity before safe dosages can be determined. Indoor tanks and systems typically have much less organic matter (dirt, detritus) than do outdoor systems usually resulting in the copper remaining in solution longer. To avoid toxicity to fish, water changes are recommended after 4-8 hours of treatment for indoor situations. Last Note; Dangers of using copper sulfate. 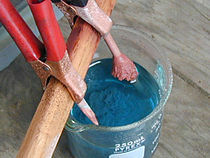 How does copper sulfate work? How might I be exposed to copper sulfate? What are some signs and symptoms from a brief exposure to copper sulfate? Beneficial bacteria such as our all natural, Bio Lake Clear product, breaks down organic matter in the pond including silt, sludge, decaying plants, etc. into harmless chemicals. Beneficial bacteria and algae both feed on nutrients in the water available from the silt, sludge, decomposing plants, fertilizers, etc. By adding beneficial bacteria on a regular basis, you increase the beneficial bacteria colonies and therefore have more bacteria working for you to keep the pond clean, clear and healthy.